Turkey’s Foreign Ministry summoned Washington’s top diplomat in Ankara on Monday to hear the case against the U.S. decision to suspend processing non-immigrant visa applications, according to Turkish diplomatic sources. Ministry officials urged Charge d’Affaires Philip Kosnett to have the embassy reverse the move, as it both inconveniences people and will fuel an “unnecessary escalation” of tensions, said the sources, who asked not to be named due to restrictions on speaking to the media. Turkish Foreign Ministry Undersecretary Umit Yalcin late Sunday night also spoke on the phone with U.S. Ambassador John Bass, who is out of Ankara, with Kosnett acting in his stead. After the U.S. Embassy in Ankara late Sunday announced it was suspended all non-immigrant visa services at all U.S. diplomatic facilities in Turkey, Turkey's Washington Embassy followed suit in suspending non-immigrant visa services, saying, "Recent events have forced Turkish Government to reassess the commitment of the Government of the United States to the security of Turkish Mission facilities and personnel." The decision came after Turkish national Metin Topuz, confirmed by the U.S.’ Istanbul Consulate as a local employee, was remanded in custody over terror charges by an Istanbul court last week. Topuz is linked to the Fetullah Terrorist Organization (FETÖ), the group behind last year’s defeated coup in Turkey, according to a judicial source. FETÖ and its U.S.-based leader Fetullah Gülen orchestrated the attempted coup, which left 250 people martyred and nearly 2,200 injured. Topuz has been linked to a number of FETÖ suspects, including police commissioners and former prosecutor Zekeriya Öz, a fugitive accused of attempting to overthrow the government through the use of force, added the source, who asked not to be named due to restrictions on speaking to the media. The Turkish Embassy in the U.S. on Sunday announced that processing non-immigrant visa applications have been suspended. "Recent events have forced Turkish Government to reassess the commitment of the Government of the United States to the security of Turkish Mission facilities and personnel," said the Turkish mission in a statement. 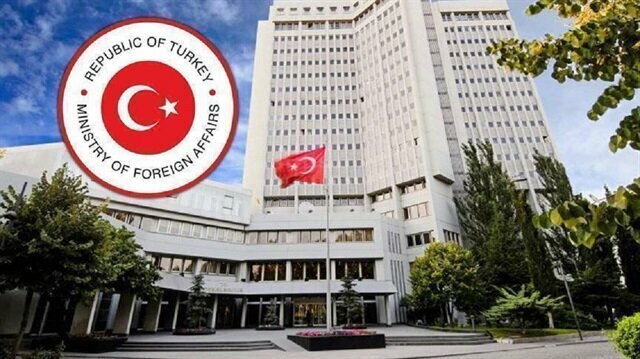 "In order to minimize the number of visitors to our Embassy and Consulates while this assessment proceeds, effective immediately we have suspended all non-immigrant visa service at all Turkish diplomatic facilities in the US. "This measure will apply to visas and passports as well as e-Visas acquired at the border," read the statement.Turkey's move in retaliation to the U.S. Embassy in Ankara which said it suspended all non-immigrant visa operations in Turkey. Earlier, Turkish national Metin Topuz, confirmed by the U.S.’ Istanbul Consulate as a local employee, was remanded in custody over terror charges by an Istanbul court on Wednesday.Topuz is linked to the Fetullah Terrorist Organization (FETÖ), the group behind last year’s defeated coup in Turkey, a judicial source said on Wednesday.FETÖ and its U.S.-based leader Fetullah Gülen orchestrated the attempted coup, which left 250 people martyred and nearly 2,200 injured.Topuz has been linked to a number of FETÖ suspects, including police commissioners and former prosecutor Zekeriya Öz, a fugitive accused of attempting to overthrow the government through the use of force, added the source, who asked not to be named due to restrictions on speaking to the media.